The U.S. stock market had its best six months since 1933 with the S&P’s 500-stock index gaining more than 50% from March 9 to Sept. 9. 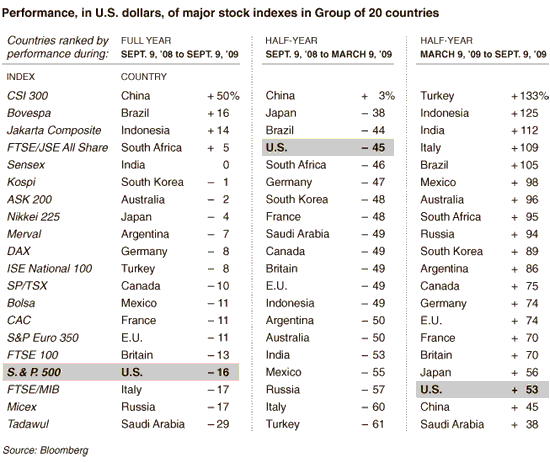 As this NYT graph shows, when compared to other major stock indexes, the U.S. market was one of the least volatile markets in the world. We did better than most on the way down, but worse than most on the way back up. Looking at the graph however, this cycle has done little to reinforce the international diversification approach to investing as a safe notion and strategy. As you can see from the numbers, balancing the risks of investing in any one market would have been quite ineffective.